What he is talking about are the Ontario Daily Extend activities, something I helped set up for the project (and Terry took off with it). This is a spawn of the DS106 Daily Create which is now in its 6th year of continuous operation. Each day the web site publishes a new thing, and you respond by replying to a special twitter account with a hashtag specific for that day. This gives things like a way to show all your contributions in a unique URL as well as offering a leaderboard (many people just happen to be competitive). The idea of (what I call) Daily _______s are offering a small, daily challenge that can be done quickly, but also, in some way make you try something new- be it a media creation technology, a learning resource, or just something experimental. It also is useful for people new to twitter, it gives a meaning and purpose for tweeting, and then experience with how tweets, hashtags, replies all work. Part of the success (IMHO) is that the stakes are really low here. When I teach (like putting one into NetNarr as The Daily Alchemy) I ask my students to do 3 per week. They get to choose. I don’t grade on what they do, I grade on how they document their approach. This means, as I also do in DS106, that I do not care how you do it- and I encourage students to break rules, do the opposite, as long as they do something interesting. I find students love this at first, and somewhere around the 2/3 portion of the course, it begins to turn into a chore (when I usually dial back the required number). I also make ut a requirement for them to add 1 or 2 dailies of their own, since all sites feature a public submission form (e.g for DS106). And what Terry knows, and other people who have helped keep the dailies running (Mariana Funes took over the DS106 ones for a few long stretches, and now runs her own Daily Stillness) and Bill Genereux who is currently filling the DS106 supply, is that the most fun is creating daily challenges for others. Every person who does this brings their own creativity into play. Mariana would tease me that mine were too easy (and I thought hers sometimes complex). Terry fills his with the kind of humor and playful creativity he brings to all his work. I always loved the times when some weird tweet, or random stumble across a weird generator site, or some other thing would light up the “that would make a great daily”. Making these donuts dailies is a huge reward! All of these spawn sites are made possible by the generalized WordPress theme I made, called The Daily Blank. I’ve spawned myself the following iterations- I am making a case for it on nearly every project. I love the dailies maybe as much as Terry! This is my another of nine posts for the Ontario Extend 9x9x25 challenge. 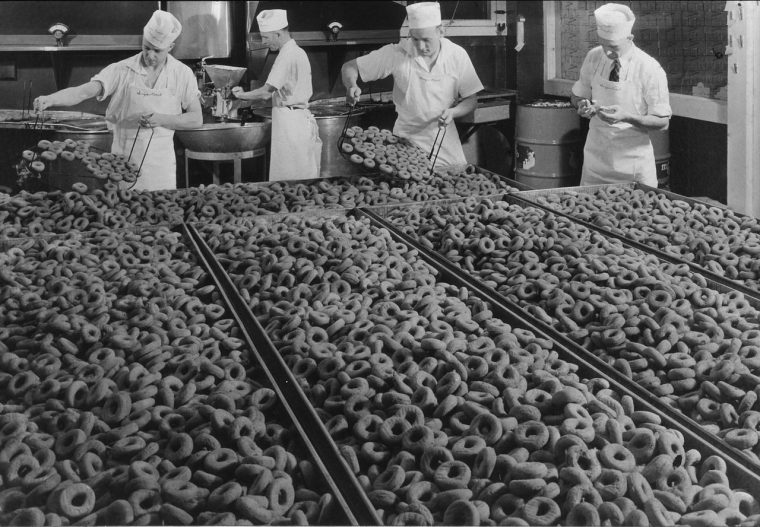 Featured Image: Men making donuts at the Sugar Crest Donuts Company in Portland, Oregon (3724233708).jpg Wikimedia Commons image shared into the public domain. Is there a way to make a daily challenge to show who loves making dailies the most? the Make A Daily With The Most Love In It Daily?